Bangkok is a place we will always keep going back to. Although, you might only be able to spend a few days there as part of your Thailand holiday. 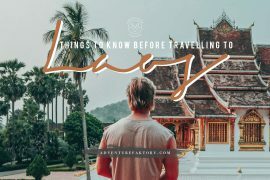 I feel like we can write dozens of these articles as Bangkok has so much to offer for a traveller coming here. 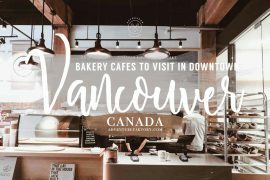 Every single time we come here, we are finding brand new things to do, see or eat. We thought it would be a good idea to share with you a 3-day guide. This is just a list of a few things to do in Bangkok if you have a few days here. Some of these are very popular and others are still yet to be truly discovered. Let us know if you end up following this itinerary. Bangkok is one of those cities with the perfect contrast of local culture and modern innovations. We thought for your first day of visiting Bangkok would be a great idea to see its modernity. If you are from the USA or from Dubai, you must be like: “Well we have a lot of malls” and we would say you are probably right but the malls in Bangkok are completely different. Some of them have incredible designs and everything is photogenic. Others like MBK is heaven for tons of deals where you can find incredible linen pieces for a price you will get nowhere else. In the basement of MBK find a wide range of cheap local Thai food. Terminal 21 is our other personal favourite where you can find a lot of entrepreneur’s local shops with quality products. It is also food heaven, not to forget the top floor, Pier 21 where the local food court is an incredible bargain, a must stop for your lunch on that day! If you have a look at the Bangkok skyline, you may have noticed this tall well-designed building towering over the sky. You might be looking at Thailand’s new tallest building, the Mahanakhon building. It is not just a tall tower but an experience in itself. It is 314m up in the air and gives you 360-degree views of the Bangkok skyline. Worth getting a ticket to go to the rooftop. A great time to be here is during a golden sunset as it is exceptional for photography at this time. You can even get a view of the river and the temples around it. The staircase at the top is another great place to take a few photos with an incredible background. The highlight of the Skywalk is the glass bottom floor which dangles out over the road. Looking down, you can see everyone and everything so if you don’t like heights, it is certainly not for you. It is extremely safe and a great Bangkok experience. Our tip: Get tickets for sunset and get there a little early to scout around for your perfect spot. 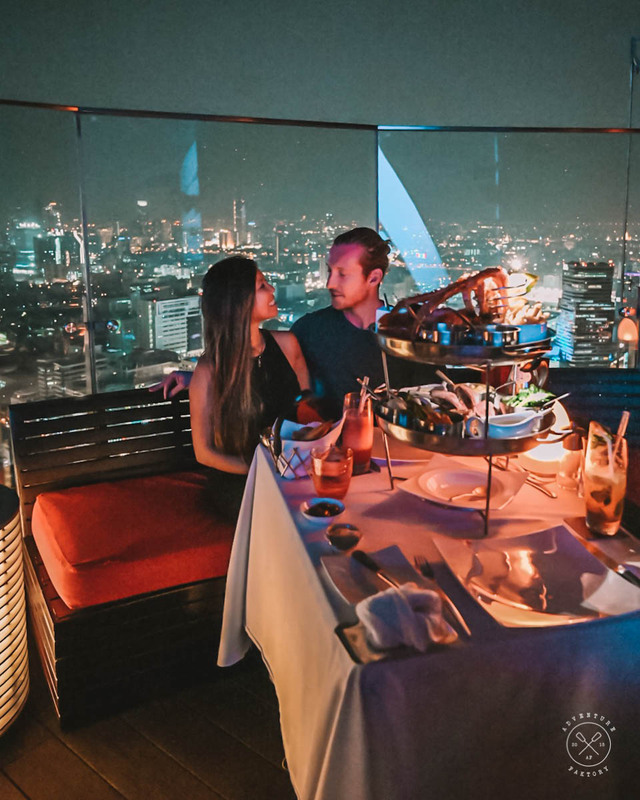 Depending on the ticket you booked, you can enjoy a signature cocktail champagne as you watch the sunset over a beautiful Bangkok city line. It is open from 10 AM to midnight and the ticket prices start at 965 THB (around 30$US or 96 AED). If you decide to go last minute, you can book your tickets last minute before even arriving on-site on the Klook App. If you are like us and like to stay fit whilst traveling and happen to have a ClassPass membership, well good news, they have a whole range of places you can redeem your credits. We personally really enjoyed booking CrossFit classes at The Aspire Club, conveniently located at the Phrom Phong BTS station. 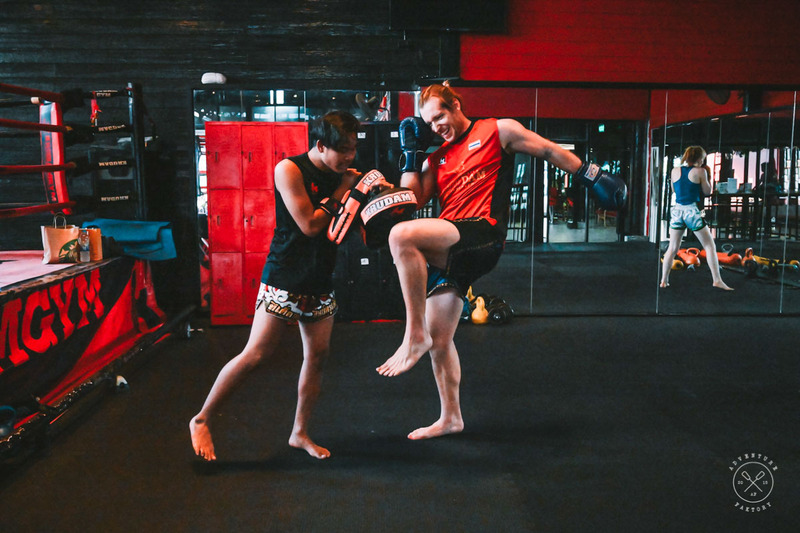 If you want to learn about the local Muay Thai martial art, you can go on MuayThaiOk to discover a range of fighting gyms. We personally have tried Krudam and loved the experience. For an evening meal, we recommend you to head up high at the Centara Grand Hotel to the Red Sky Bar. This place is fantastic for a romantic dinner. 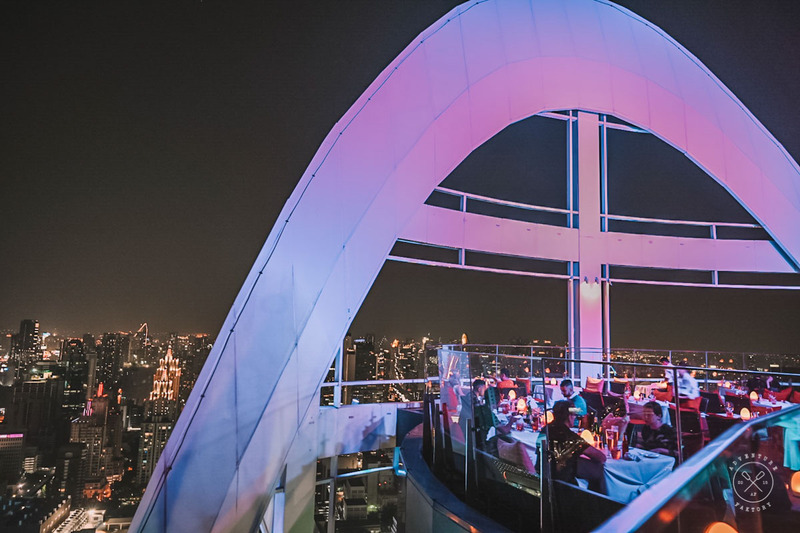 The Red Sky bar is one of Bangkok’s most famous rooftop bars with a 360-degree view of the city. 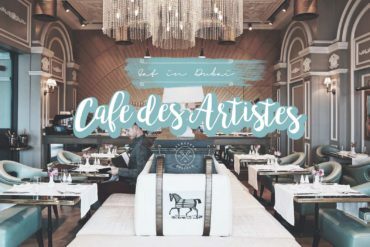 It serves an urban bistro style and has indoor and outdoor seating. We highly recommend the outdoor setting as you get a great view of the city as the sun goes down. Getting there before the sun sets with a cold drink is a highlight of our time in Bangkok. 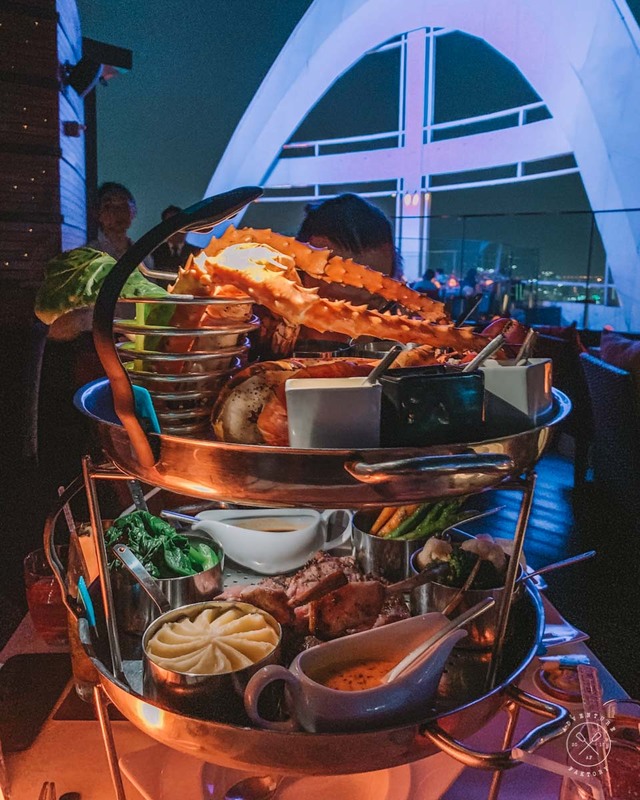 If you are looking for something filling to eat, make sure you get the Red Sky Surf and Turf Tower. It all came out in an afternoon tea style tray, while each layer had something different to eat. Top layer being seafood, the bottom one delicious mixed slices of meat, cooked perfectly the way we wanted. The meal was absolute quality and the service was special. They made sure that our drinks were full and even removed the shells of the seafood for us for easy and clean consumption. Thailand is known for its photogenic temples. 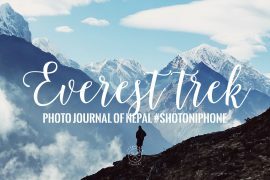 There are so many it is quite hard to be able to visit them all but we have narrowed down three you could do in one single day. You have not done Bangkok properly if you have not visited a temple. If you are going to see one, make sure it is Wat Pho. It is a large, garden-filled grounds full of details temples, statues and doorways, perfect for all the photographers out there. Do not miss the Reclining Buddha which is 15m high and 46m long. Now most temples have a dress code, so no short skirts and cover the shoulders, long pants would be even better to make sure you do not have to rent clothes to get in. We wrote a full guide to visit Wat Pho Temple here you should read. Right near Wat Pho, you might as well go see Wat Arun! It is very beautiful for photos and you can read all about it in our Wat Arun Temple guide and have some photos as inspiration for your own shots. This famous temple is on the back of the 5 Baht coin so it is very recognizable. It opens at 6 am so if you want to get there for pictures, get there before the 8:30 AM tourist buses do. Our favourite things about this place are the monks that live on site all go to prayer and walk around the temple. Beautiful footage and great to see. If you are looking for an authentic Royal Thai experience, then a visit to Baan Suriyasai is a must eat place. It is also listed in the Michelin Guide of restaurants. 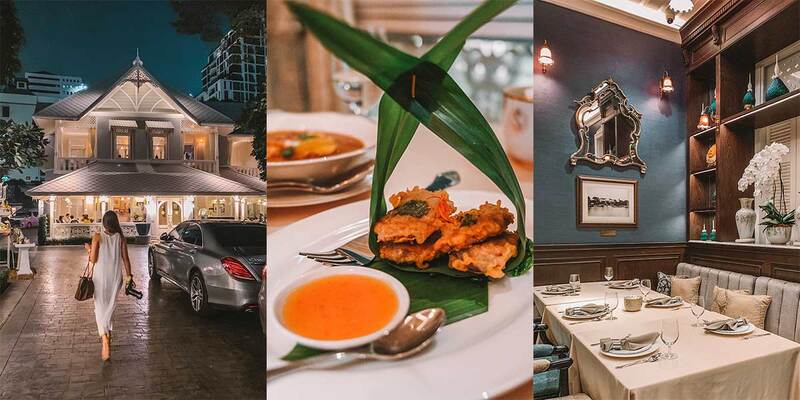 There you will be served Royal Thai cuisine, with recipes that have been passed down from the royal family chefs that were there 100 years ago. The building is a classic colonial design and is very photogenic. There are photos all over the walls from the generations of royal families that have lived there in the past. The menu and food itself took us on a culinary journey in the way of Thai culture. The food came out in several courses and gave us a taste of many flavours of Thailand. The presentation of the food is exceptional and the service is as good as expected. The mains are served with communal dishes to share in the middle, just the right way how Asians do it traditionally. Make sure you get a taste of the Crispy Pancakes. 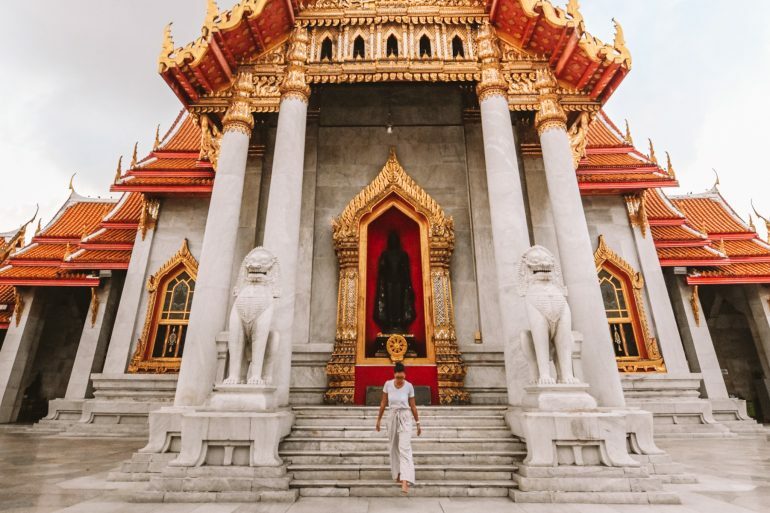 After seeing a taste of Thai culture with their temples and palaces, we suggest you dive more into the culture by immersing yourself completely in neighborhoods like Chinatown. For photographers, Chinatown is a truly beautiful place you should go visit. Near Chinatown are many places you can see and visit as well. Bangkok is heaven for markets both for knick-knacks but also for food. 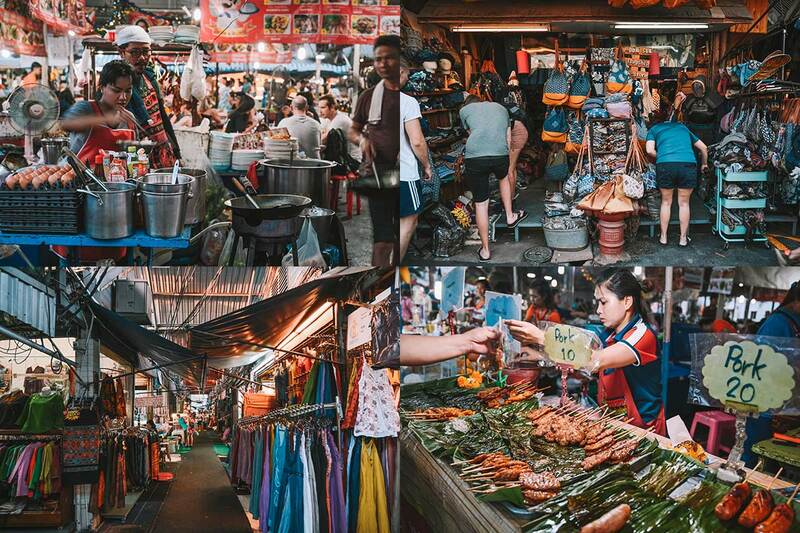 During the weekend make sure to visit the Chatuchak Market. Every night there are other markets you can go to and we recommend you the Ratchada Rod Fai Train Night Market as it is one of the famous photography spot of all the stalls at night but also a great place to eat tons of food in addition of getting footage of it! Have you ever visited Thailand? If yes, share with us your favorite sights! Don’t forget to book your travel insurance before traveling. If you don’t have your flights, check out ways to book the cheapest fares here.